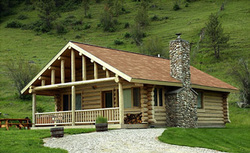 Rye Creek Lodge is a peaceful collection of luxury hand-crafted log homes. During your stay amid the naturally beautiful surroundings, you are likely to see deer, elk, moose and other wildlife. Trapper Peak, one of Montana's tallest mountains, provides a magnificent setting for Rye Creek Lodge. A massive stone fireplace will take the chill out of the cool Montana evenings, or you may luxuriate in a private outdoor hot tub. Each cabin has a fully equipped modern kitchen and a propane fired BBQ under a covered porch. You will surely not be at a loss for things to do during your stay. Hiking in the Bitterroot National Forest is a memorable adventure, with trails starting almost right outside your front door. Fly fishing trips are available on the famous Bitterroot, Salmon and Big Hole Rivers. Horseback riding, mountain biking, white water rafting, cross-country and alpine skiing and snowmobiling are also nearby attractions. Enjoy the rugged beauty of Montana from a luxury log home! Rye Creek Lodge is open all year. Call toll free for reservations or information. Directions: Rye Creek Lodge is located 1.3 miles east of Highway 93 at the south end of the Bitterroot Valley on Rye Creek Road (nestled between the Sapphire Mountains and Trapper Peak). Rye Creek Road is 4 miles south of the small western town of Darby, and 65 miles south of Missoula, Montana.